Come to discover the most beautiful landscapes in provence through private thematic trips or free trips. We welcome you in the airports and train stations you have selected and we help you carry your luggage to your destination. We’ll do our best to offer you an atmosphere fit for relaxation and chill. Your kind, attentive driver will take you, gently and discretely to your destination. Transfer in Provence your chauffeur driven car. We also suggest you the organization of tours to discover Provence at your own speed. Travel as cool as possible in an air conditioned private vehicle. 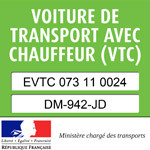 No extra charge by Transfer in Provence whether by night or on public holidays, but also for extra luggage or toll fees. Our company proposes all inclusive prices without any bad suprise. 7 days/7 et 24 hours/24. Book in 3 stages ! 1) Fill in the booking form.